Two men are working to promote leadership and improve education standards through reintegration of sports into school curriculum. While the rest of the world continues to mix both sports and education to grow well-rounded individuals, Pakistan continues to lag behind in its attempt to reinvigorate its education system. The snubbing of Paksitani players in the recent Indian Premier League (IPL) bid has not gone down well in the neighbouring nation whose people are now venting their anger on the Internet at Sanjay Puran Singh Chauhan’s upcoming sports film ‘Lahore’. ‘My film has become the soft target because of the IPL bid boycotting the Pakistani players. The timing has been unfortunate and a mere coincidence that our promo came out at this time and we are being targeted for that with hate mails in reaction,’ an upset Chauhan told IANS on phone from Mumbai. ‘Pakistani people are thinking that it is a negative trailer. But ours is a very balanced promo and I don’t think it should raise so many negative remarks from them,’ he added. Pakistanis are slamming the film promo and predicting the film will be a ‘super duper flop’. ‘I’ve just tried showing the sports rivalry and the condition of the players as in what they go through at that time. I hope their (Pakistanis’) perception changes after they see the film,’ said Chauhan. Set against the backdrop of competitive sports (kick-boxing) in the international arena, it stars Nafisa Ali, Farouque Shaikh, Ashish Vidyarthi, Nirmal Pandey, Sabyasachi Chakraborty, Saurabh Shukla, Sushant Singh, Kelly Dorji, Shraddha Das, Shraddha Nigam and Mukesh Rishi. Actor Aanaahad makes his debut with the film. Distributed by Warner Bros. Pictures India, ‘Lahore’ has been produced by Sai Om Films Pvt Ltd. Releasing commercially March 19, it has already an international award — the jury award for the Best Feature Film at the 42nd WorldFest International Film Festival, Houston, Texas, where the world premiere was held on April 20 last year. Chauhan puts forth another reason for receiving the hate mails. Despite the negative reaction, the director is looking forward to a Lahore premiere for his film. ‘We want to have the premiere of the film in Lahore because it is the title of the film and plays a crucial part in the movie. It shows India and Pakistan in a new light. Though the cast and crew are a bit concerned about security measures but we are still trying to get the visas etc,’ he said. 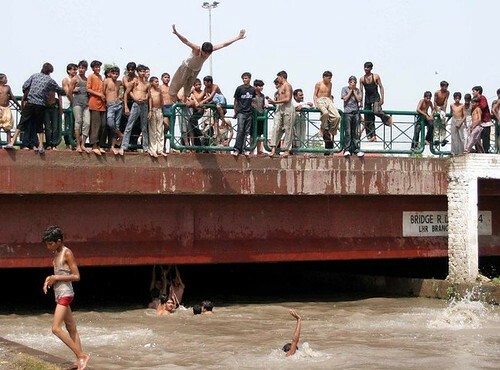 Columnists, critics, students, travelers, and bloggers gather together to share their memories of Lahore’s fabled canal at the Pakistan Paindabad blog with excellent pictures taken by Usman Ahmed. 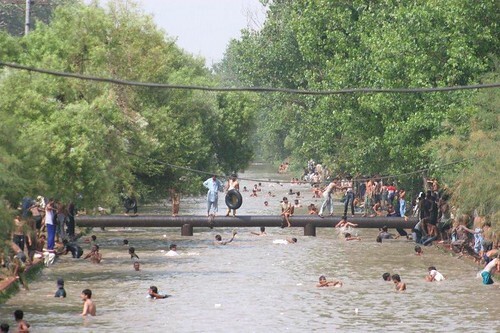 Constructed in 1861, this 82-kilometer-long, tree-lined Banba-wali Ravi-Bedian (BRB) stream slices its way through the heart of Lahore – meandering through posh colonies, smooth highways, famous colleges, scenic student hostels and cheery cricket grounds. Here are the musings and observations of few people nice enough to share their “canal moments” with us.